Continuing from my previous posts (Chapters 1-11), skipping Chapter 12 because there's no conversation/dialogue going on. So, moving right on to Chapter 13, which was about the arrival of Mr. Collins, Mr. Bennet's distant (dreaded) cousin, at the Bennet family home in Longbourn. 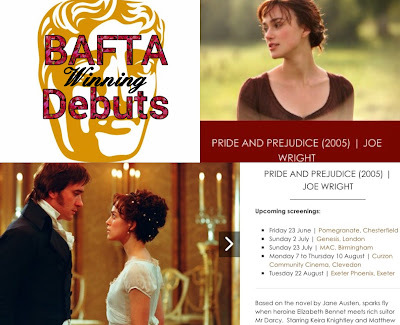 7 BAFTA-Winning Debut Films including Joe Wright's Pride & Prejudice to get Screenings in the UK! 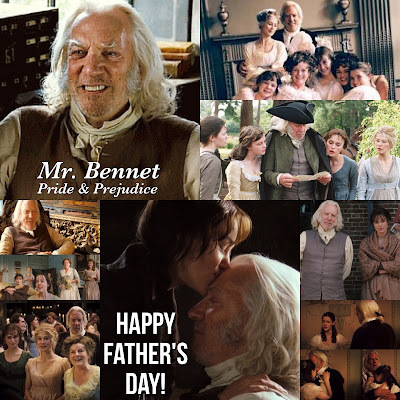 which included Joe Wright's BAFTA Award winning feature film directorial debut, Pride & Prejudice. 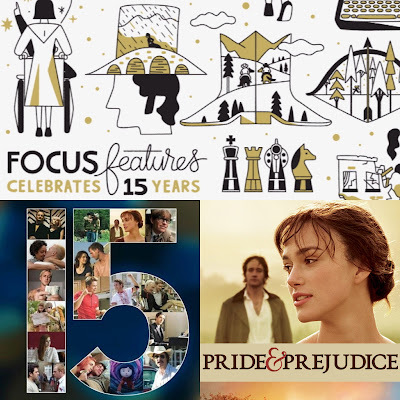 Focus Features Celebrates 15 Years with Focus Screening Series including Pride & Prejudice 2005 film's Theatrical Screening in July! 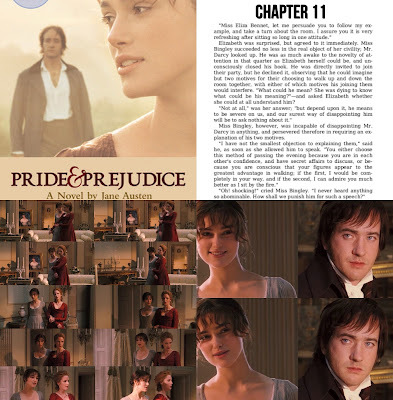 2017 is the 15th anniversary of indie studio Focus Features (who distributed our favorite Pride & Prejudice 2005 movie). 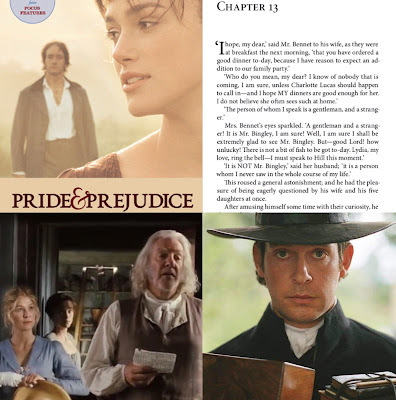 To celebrate its 15 years, the studio is putting together “The Focus 15 Screening Series”, a collection of throwback screenings that will highlight some of Focus’ most successful films including three of Joe Wright's films: Pride & Prejudice (starring Keira Knightley & Matthew Macfadyen), Atonement (starring Keira Knightley with Brenda Blethynco-starring), and Hanna (Tom Hollander co-star)...plus Eternal Sunshine of the Spotless Mind, Moonrise Kingdom, Brokeback Mountain, Milk, Shaun of the Dead, Burn After Reading, and more. These screening series will be held in Los Angeles, New York, and London. Click here (or scroll down below for P&P movie's schedule) to find out where and when the films will be showing and how to get tickets. While Carey Mulliganis currently filming her upcoming 4-part BBC TV Mini-series, Collateral and pregnancy (her second one, if confirmed...congrats to her!) rumors are also being reported as she was spotted with a baby bump on set. Let's not get into her personal life here, instead, let's talk about her TV and film work. She has a new film project that's been reported by The Hollywood Reporter and is based on the true story in which she'll be starring as Kate Webb, a Vietnam War Correspondent in On The Other Side. Continuing from my previous posts (Chapters 1-10) and moving on to Chapter 11, which remains a continuation from the Netherfield scene where Elizabeth & Darcy still banter with each other along with the Bingley siblings in the mix. 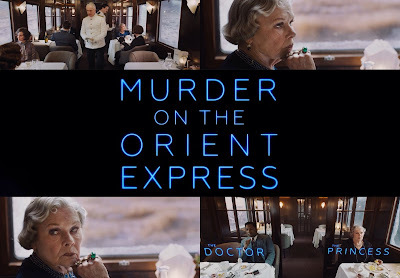 The first trailer was released to Sir Kenneth Branagh's new film adaptation of Agatha Christie's 1934 mystery novel, Murder on the Orient Express, which Dame Judi Denchco-stars as Princess Dragomiroff. The film with starry cast such as its director Kenneth Branagh, Johnny Depp, Penélope Cruz, Daisy Ridley, Michelle Pfeiffer, Josh Gad,Willem Dafoe, and more will be released in US Theaters later in the year, November 10th (moved up from November 22, 2017)!